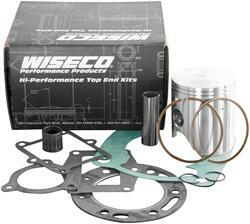 Wiseco Racers Choice SuperMini piston kits are the excellent choice for doing your bike rebuilds the right way! These top-end kits feature Wiesco's high-quality, forged pistons matched with high-quality components to provide you with the ultimate performance and durability for your SuperMini application. Meet the racing demands for strength and toughness by choosing the optimized performance of Wiseco Racers Choice SuperMini piston kits.